How can you start the New Year out on a good note? Setting some goals for yourself can be a positive way to improve your health and happiness in 2015. 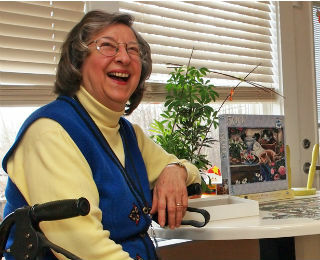 Older adults can gain a lot from taking care of their physical and emotional health. This can be the year you bike 25 miles with your granddaughter or take your grandson camping like you always discussed. By making a plan, you have taken the first steps to being healthier and happier in 2015. Getting older doesn’t have to mean you lose stability and decrease your regular activities. Empower yourself this year to learn more about how you can improve your balance and prevent falls. A great place to start is exercising to help strengthen your muscles. Another option is getting a falls risk assessment to educate yourself about ways you can prevent falls in and outside of your home. Taking these steps will make you safer, stronger and more confident in your surroundings to participate in activities you enjoy. The starting block for good health is regular sleep. Goals like eating right and exercising more can be more difficult when your body is exhausted and worn out. Take an honest assessment of your sleeping habits. Do you have sleepless nights? Are you exhausted during the day? If so, make a commitment to improve your sleeping habits in 2015. Have you always wanted to see a Broadway show in New York City? Or would you love to learn how to do yoga or ballroom dancing? Make 2015 the year you fulfill a goal on your bucket list. Older adults are often selfless and always worried about what they can do for their families and their community. Make this year the year you do something that you have wanted to do for yourself. The old saying, “Use it or lose it” comes into play when you think of mental health. Working out your brain can be just as important as working out your body. You can challenge and exercise your brain in numerous ways. One way to promote mental health is doing crossword or Sudoku puzzles to keep your mind active and healthy. You can also learn a new musical instrument, or play a new game with your friends. By consistently exercising the brain, you will improve memory and brain function and reduce the risk of cognitive diseases.